« Nintendo Download Update – It’s Ninja and Burger Time! We usually like to keep a close eye on the pre-order and sales rankings for various videogame items and categories at Amazon, mostly just for own own information. While it’s not necessarily an accurate way of gauging actual sales, it can be useful for following trends as well as promotions. Anyway, with the PS Vita coming in the very near future, we decided to compile a list of the “most popular” Vita software and hardware. It’s far from scientific, and we’re not even exactly sure what metrics that Amazon uses to determine how popular something is besides pre-orders and or sales, but it’s a safe bet that they will reflect the relative sales rankings when all is said and done. Of course, these can change daily, if not hourly. Anecdotally, the Amazon trends for the PS Vita seems to follow the GA Staff’s purchasing plans pretty closely, so we expect that it may be the case for those with similar interests. In terms of hardware, it’s the newly announced PlayStation Vita 3G/Wi-Fi Launch Bundle (with 8GB card and free PSN Vita download) that’s now number one, with the WiFi and First Edition bundles right behind it. Somewhat surprisingly, the $100 32GB PlayStation Vita Memory Card is the top accessory, followed by the PlayStation Vita Protective Film – Two Pack and the 8GB PlayStation Vita Memory Card. The cases, pouches, cradles and whatnot mostly round out the rest. As you can see, the list is dominated by official first party merchandise. On the software side, the top 3 should be pretty obvious with Uncharted: Golden Abyss, Hot Shots Golf: World Invitational and wipEout 2048 rounding out the top 3. It’s not coincidental that those are also my personal top 3, though I’d possibly jump Hot Shots Golf right to the top. Other than SCEA, Ubisoft seems to have the second most games in the top 10, with EA, Capcom and Tecmo KOEI with one game a piece. There’s seemingly a little bit of every genre represented in the top 10 as well with shooting, racing, fighting, sports, puzzle solving, platforming, ninjas and weirdness. 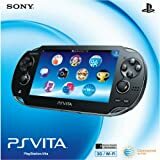 With the launch beginning as early as next week, for PlayStation Vita First Edition Bundle buyers at least, it’s doubtful that the lists will change much before that. If you’re still confused on what to get, make sure to take a quick look at our PlayStation Vita pre-order guide, right here.